2 Bedroom, penthouse apartment overlooking golf course. 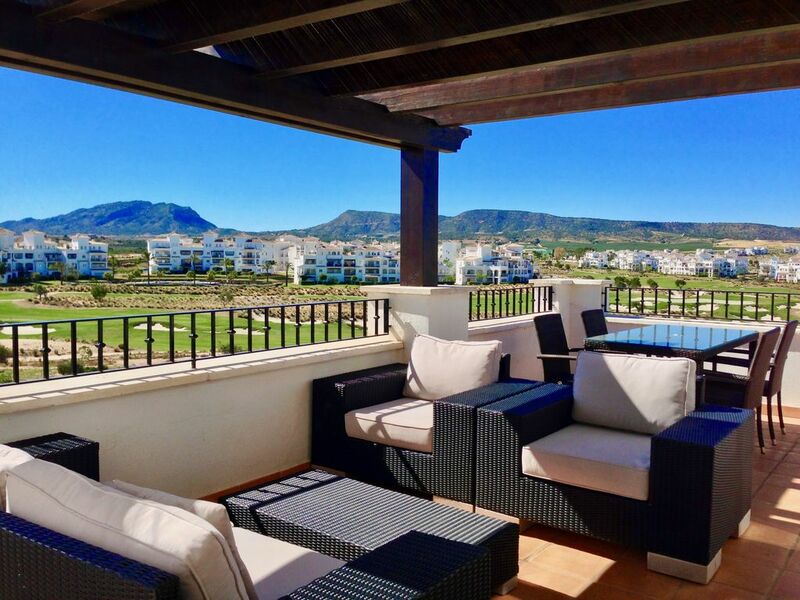 La Vista penthouse apartment is well situated on the Hacienda Riquelme Golf Resort with frontline views of the golf course, mountains, swimming pool and sports centre. It's orientation ensures that you benefit from sun on the terrace at sunrise to sunset where you can watch the sun drop behind the mountains of the Sierra Espuna National Park. It has air-conditioning and gas central heating in the living area and both bedrooms. It is furnished in a contemporary style with a luxury leather sofa in the lounge, 55" Samsung Uktra 4K TV, xBox One, and Bose SoundTouch 30 sound system, free WiFi. English TV channels are available. The bedrooms benefit from high quality beds and pillows for that extra deep sleep. The extended kitchen has a fan assisted oven, induction hob, Dulce Gusto coffee machine, dishwasher, large fridge freezer, washing machine, micro wave, toaster, kettle, blender and other mod cons. The extended dining area features a panoramic view of the golf course. There is a large wrap around roof top sun terrace with stunning views of the mountains, swimming pool, golf course, sports centre and lakes. It is equipped with luxury soft furnishings and a Weber gas BBQ for outdoor dining. There are 4 hotel quality Balliu pool sunbeds for the exclusive use of La Vista penthouse guests. Please note that most apartments on the resort are not equipped with pool quality sunbeds. I live in England with my wife and daughter. My wife and I both work and holiday in our apartment at the Hacienda Riquelme Golf Resort as well as taking vacations in other parts of the world. We love the mediteranean climate and food. The apartment has been furnished with a touch of elegance and luxury that is hard to find in other apartments on the resort. There is a large swimming pool right next to the apartment with hotel quality sun beds provided exclusively for La Vista guests. The Hacienda Riquelme is one of many resorts located around a series of golf courses that make up the Nike Golf Trail. The resort has its own supermarket, bars and restaurants as well as 24hr security in a closed gate community. This region of Spain has retained its natural beauty with its national park historic buildings in Murcia, Cartegena and Lorca. Only 15 minutes from the Hacienda there are golden sandy beaches and the clear warm waters of the Mediterranean sea. Bathroom with bath/shower over, wash basin and toilet. Internal telephone in lounge for calls to resort facilities. Air conditioning in lounge and both bedrooms. Central heating throughout the apartment. Clean fresh bed linen provided. Underground garage available with lift access to apartment. Bath towels provided. Guests are advised to bring their own beach towels. Outdoor gym available free of charge. Furniture features an arctic-white leather sofa in the lounge with additional tub chair. Large, fully equipped kitchen with panoramic views of golf course. There is a dining area for 4 people in the kitchen with panoramic views of the golf course. There is also another dining area for 4 people on the terrace with views over the golf course and pool. 55" Samsung Ultra 4k TV in lounge. Resort cable delivers UK channels. Bose SoundTouch 30 for bluetooth and Wifi streaming. A selection of books available to read. xBox One with 2 controllers. The resort is designed with open access to all of the resort gardens. Access to the terrace from the master bedroom. Roof top terrace with ultra luxurious and comfy soft furnishings and additional dining area with BBQ. There are 2 full size and 2 Padel tennis courts for use by residents. The Jack Niclaus 18 hole par 72 golf course forms part of the Nike Golf Tour. Whilst staying at the resort you will have access to the Hacienda Riquelme, Alhama, Saurines, Mar Menor, La Torre and El Valle golf courses. Resident rates are available. There are 4 hotel quality sun beds by the pool for the exclusive use of La Vista penthouse guests. Please note most apartments on the resort do not supply sun beds. There is a resort supermarket, cafe/bar, restaurants, golf shop and club house. What an amazing apartment, clean and beautifully furnished and the kitchen is a joy to be in! It is always a worry when you book somewhere you've not been to before but this was superb. We had contact with John a couple of times and he was extremely friendly and helpful and came straight back to us. The golf course is interesting to say the least and facilities on the area are superb. We would definitely recommend anyone looking for a beautiful place to stay to book here. Hopefully we will return! We are a family of 4 who stayed in this apartment in August 2016 for a week. It was a fantastic 2 bedroom penthouse apartment, with a large well equipped kitchen and spacious balcony that had stylish and comfortable furnishings with shade. The decor throughout was immaculate and all mod-cons were catered for. Of particular note, both bedrooms have their own separate air-conditioning unit which made for a very comfortable stay in the summer heat. Around the adjacent pool (which was never too busy), there were 4 'proper' sun loungers for our use. The owner John, was extremely prompt, professional and efficient in all of our dealings with him. We cannot recommend highly this apartment highly enough and will be looking to return again soon. The apartment is located on a very well maintained golf resort with visible security patrolling day & night. The pool area kept both my boys ((aged 9 & 14) entertained and is clean, tidy & free from litter. The apartment directly overlooks the 14th tee, tennis courts & football kickabout area, which made access for my boys very easy! They also thoroughly enjoyed a daily visit to the driving range, courtesy of you supplying the golf clubs thanks. The actual apartment was also very comfortable and clean on arrival. However, on a minor point we didn't receive a change of bed linen during our 11 night stay - did they forget? Must visits would have to include Cartagena (fantastic Roman remains), Murcia (gorgeous cathedral), watching the evening volleyball matches on the beach at Los Alcazares and also enjoying steak at the Celtic Steak Bar & probably one of the best chinese meals we've ever had at 'Run' restaurant in the town (5 mins from the beach). Overall, a really good family holiday thanks John! The region benefits from an average temp of 21c and 320 days of sunshine a year which. It is said to be a mini micro climate and highly recommended for anyone suffering with joint pains, due to the dry climate. There are many beautiful sandy beaches all along the coast. The Mar Menor is a large sea water lagoon which is one of the cleanest, safest, warmest waters in the Med. Murcia City is the capital of this region, it is a vibrant, cosmopolitan city only 20 minutes drive from Hacienda Riquelme, its main sights are its cathedral and historic architecture along with lots of modern shops. San Pedro del Pinater: has all facilities for a great many water sports, such as sailing, scuba diving or windsurfing. The port of Cartegena is 30 mins drive away and worth a visit, it is famous for its quiet fishing village of Cabos de Palos with a fine selection of fish.